No one says everything you want to hear in the exact order, depth, and detail that you prefer. That’s why the chief tool of a good listener is a good question. 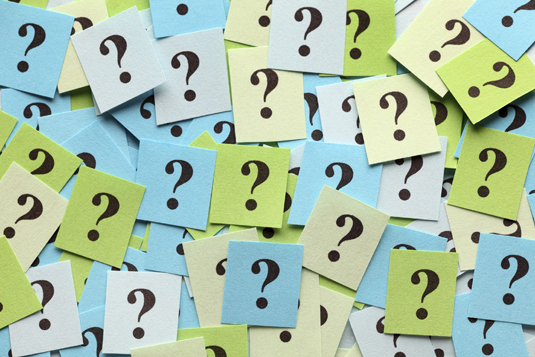 Well-crafted questions can stimulate, draw out, and guide discussion. Plan your questions. Before your meeting, outline your information goals and a sequence of related questions to help you follow the conversation and cue your notes. Know your purpose. Every question you ask should help you gather either facts or an opinion. Know which kind of information you need and frame your questions accordingly. Open conversation. Unlike simple yes-or-no questions, open-ended questions invite the respondent to talk — and enable you to gather much more information. “What do you like best about this company?” is likely to generate more valuable information than “Do you like this company?” Another tactic is to ask a question in the declarative format — “Tell me about that.” People who won’t answer questions sometimes respond better to a direct order. Speak your listener’s language. Relate questions to the listener’s frame of reference and use words and phrases that your listener understands. For example, avoid industry jargon when you’re negotiating with someone outside your industry. If someone doesn’t seem to understand what you’re asking, try rephrasing. Use neutral wording. Asking leading questions, such as “How’d you like the terrific amenities at that conference center?” is unproductive. Because the question expresses a glowing opinion of the venue, the other person isn’t likely to say anything negative about it, even if he hated the place. He hasn’t altered his feelings; he just hasn’t expressed them, and you’ve lost an opportunity to influence him. A neutral question that elicits accurate information or an honest opinion — such as “How did you like it?” — is much more helpful. Follow general questions with specific ones. Build a hierarchy of questions that begins with the big picture and gradually drills down into specifics with follow-up questions. Focus your questions so they ask one thing at a time. To get more complete answers, craft short questions, each of which covers a single point. If you really want to know two different things, ask two different questions. Ask only essential questions. If you don’t really care about the information that’s likely to come, don’t ask the question. Respect the other person’s time and attention to avoid appearing resistant to closing the deal. Don’t interrupt. Listen to the full answer to your question. The art of good questioning lies in truly wanting the information that would be in the answer. Transition naturally. Use something in the answer to frame your next question. Even if this takes you off your planned path for a while, it shows that you’re listening, not just hammering through your agenda, and it ensures that the conversation flows naturally. What does your company charge for this item? What do other companies charge for this item? Why do you think the discrepancy in pricing exists?